Initial reports: Iron Dome battery successfully shot down Grad rocket that was fired at Ashkelon. The new Iron Dome anti-rocket system intercepted an enemy missile in mid-air and scored its first operational success Thursday. The missile was a Grad-type rocket fired from Gaza at Ashkelon. Witnesses said they saw the rocket's plume after it exploded in mid-air. IDF sources confirmed the success. A 16-year old was critically wounded and another man was lightly injured when an anti-tank missile was fired at a school bus in the early afternoon. Gaza terror squads fired more than 20 rockets and mortar shells at Israel Thursday. These did not cause casualties, but one home was damaged. The IDF issued a statement Thursday evening confirming the success. 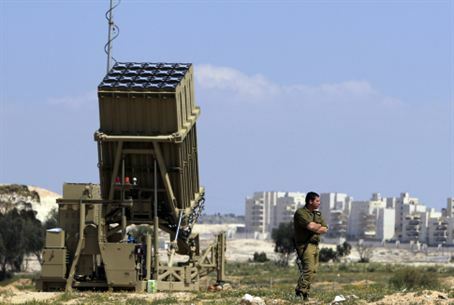 "Earlier tonight, IAF Air Defense Corps forces used the 'Iron Dome' system to intercept a rocket fired from the Gaza Strip at the Israeli Home Front. "Immediately afterwards, an IAF aircraft targeted the squad of terrorists who fired the rocket and confirmed a hit. "It should be stressed that the 'Iron Dome' system, though operational, is still under evaluation. "The IDF will continue to operate in order to defend the residents of Israel's southern communities."